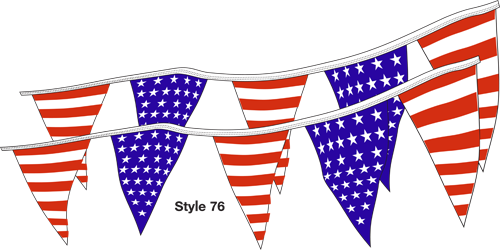 Americana Boat Pennant Strings - Show your national pride and Partriotism! Available in two types of materials, long lasting Heavy-Duty 8 mil polyethylene or Economical 4 mil polyethylene. Can last with care for multiple events or seasons. Americana Pennant Size: 12 inches wide x 18 inches tall triangles. Pennant flags contain alternate red stripes and blue stars. Pennant String is 60 feet long with 24 pennants per string. Decorate your boat with a patriotic theme.